We updated our VIP system today so that it rewards the top 10 most active customers with VIP perks at participating venues. The idea is to combine the gamification principles behind successful concepts like Foursquare and Gowalla with rewards for loyalty in a way that benefits both the customer and the restaurant. We don’t charge a percentage of the deal like Groupon or cover fees like Open Table; restaurants give perks directly to the customer. By eliminating the middle man, restaurants can afford to be more generous, which translates into better deals for guests. Because at least one visit at regular prices is required to become a VIP, this new program also eliminates the attraction of “couponers” who move from deal site to deal site looking for bargains. If you haven’t read up on the value of loyalty programs, check out this article on Restaurant Briefing that says studies show 15% of a business’ most loyal customers represent 55% – 70% of sales. Guests earn points by completing reservations based on party size. 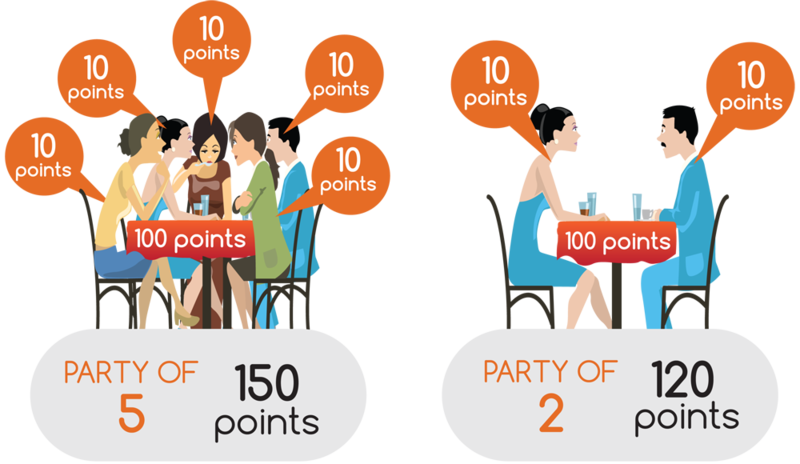 They earn 100 points per reservation + 10 points per person, so larger parties earn more points. A VIP Leaderboard counts total points earned by guests at each venue over the last 90 days and shows the 10 most active customers. 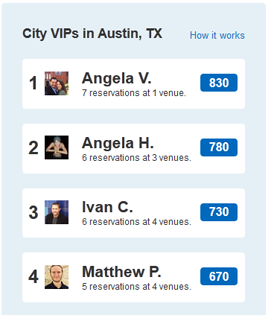 These 10 customers are marked as VIPs and earn VIP perks when they book reservations. 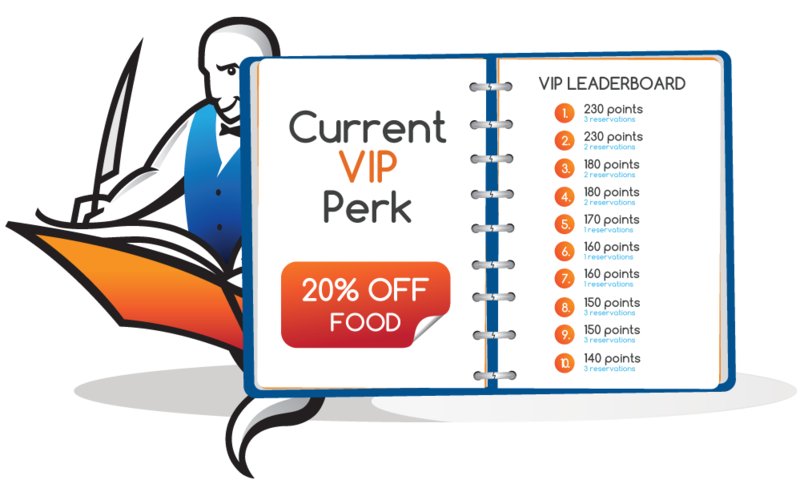 What makes this system particularly effective is that as soon as a customer reaches the VIP Leaderboard we send them an email letting them know they can earn perks and encourage them to book another reservation right away before they lose their VIP status. Even if they do happen to lose VIP status before the upcoming reservation, they still get the perk for reservations that were booked while they had VIP status. When those reservations are completed, the customer will get back on the VIP leaderboard and have the option to book another reservation to earn the reward again. To see an example of the program getting traction, check out the leaderboard for Corazon at Castle Hill. They offer 20% off the food items and have a “mature” leaderboard showing most of the top 10 customers having booked 4 or more times in the last 90 days. We have always had the tools in place to offer rewards to frequent customers, but our clients have been concerned that offering open-ended discounts might hurt their bottom line. This often led them to add boring perks that didn’t generate much interest. By limiting our VIP perks to the top 10 most active customers, we minimize the restaurant’s exposure so they can offer more compelling perks that really help motivate people to come back more often. We suggest restaurants offer 20% off the check, but they can offer anything they want, like 50% off bottles of wine under $100, buy 1 get 1 free entrees, or something subjective like a “Red Carpet Rollout” that comes with the best seat in the house and a special chef appetizer not on the menu delivered by the chef himself. It’s completely up to the restaurant if they want to get creative.